Thank you for stopping by our website, and thank you for your interest in Dynamite Christian Country. While you are here at our site, please feel free to visit the various web pages. 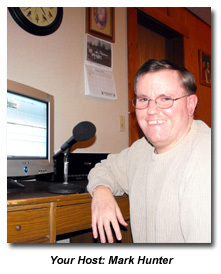 At www.DynamiteChristianCountry.com you will find information about the radio stations that carry the program, artist links and pictures, as well as information about the music played on DCC. I would like to mention that we are always open to new radio affiliates that are interested in carrying the program. We would be happy to have radio station program directors hear our online demo. Please contact me for more information. Thank you for your interest in Dynamite Christian Country and may God bless you! Have a great day! Now here is an inside look at Mark Hunter, the host and producer of Dynamite Christian Country. Current Employment: Doing data entry work for US AgNet an agricultural web design and hosting company. Favorite Foods: Pizza, macaroni and cheese, pie, cake, doughnuts and most sweets. Hobbies: Photography, CD/MP3 collecting, Listening to music. Radio History: I started my radio life by taking a DJ trainer course through 4-H at WICY AM in Malone, NY. I attended college at Liberty University where I was student station manager of the campus station. Favorite Movies: Hidden Secrets, Fireproof, Facing The Giants, Pure Country, Rocky Balboa and Flywheel. Mark's MP3 Player Is Currently Playing: Tommy Brandt, Jeff & Sheri Easter, Oak Ridge Boys. Pets: 3 Cats, Panda, Peaches and Copper. Other Interests: Carnivals, digital photography, video games, spending time with my wife, traveling, animals and going out to eat. Most Embarrassing Moment: When I broke my arm while riding a carnival ride called the Tornado at the North Florida Fair.